The house, initially a large atrium house, was further elaborated into a lavish double atrium residence after the annexation of V 1,23 in the Early Imperial period. It has been named after its owner L. Caecilius Iucundus, active in the first half of the 1st century AD, whose name and professional activity are well documented by the archive written on wax tablets that were found during the excavations in 1875 (Andreau 1974). According to our investigations between 2003-2007, the complex history of construction of this house may be followed in detail in rooms d, i, m, n, o, p, r and u. In this respect investigation has been particularly rewarding in the peristyle area (see below rooms l, r, s, t). The first phase of the house can be dated by means of the construction technique used for the monumental faÃ§ade in tuff blocks in opus quadratum, opening to the Via del Vesuvio, together with the First style cornice and upper zone decoration preserved in room d, otherwise decorated in the Fourth style. Both vestiges show that this, the earliest recorded phase of the house should be dated in the 2nd century BC. The house underwent a thorough redecoration in the late Third Style period. Its northern neighbour V 1, 23 was redecorated in the same period, which Mau used as the main argument for pinpointing the date when the two houses were united (Mau 1876, 249). Most of those decorations are today faded, lost or in bad condition. Best preserved are the famous tablinum (room i) decorations. They are generally in present scholaship attributed to the late stage of the Third Style, i.e. to the Claudian period (Strocka 2007, 307; Ehrhardt 1987 and 2012, 103), albeit there have also been voices attributing them to the late Second Style which cannot be supported by our study (Dexter 1975; Richardson 2000). The sequence of relatively dated structures established during our campaigns tend to confirm the ideas put forth by Mau. The argument of one large reelaboration period which concerns both houses maybe further strengthened by our observations of the fistulae. Water installations were introduced in connection with the unification of the two houses. Aqueduct water entered by V 1,23, the branch leading into V 1,26 is partly covered by the SW corner of its room n. In continuation, the fistula that runs beneath the mosaic floors of the tablinum and the atrium must be contemporaneous (or older than these structures), since the floors show no sign of being secondarily adjusted. In the present state of knowledge, nothing contradicts the hypothesis of one next to all encompassing reconstruction phase corresponding to the merging of the two houses, presumably in the Claudian period. The reconstruction phase included a new configuration of the suites of rooms on the northern and eastern side of the peristyle. Room o has several subsequent construction phases and in room r it is worthwhile to note the stucco in the Third Style that Mau already observed and which is still present in the niche of the eastern wall. Many rooms were redecorated according to the Fourth Style (rooms f, g, n, o, p, q, r, s, t). The results of the plaster analysis suggest two phases of Fourth Style decorations. The earlier assuredly antedates the famous earthquake of AD 62/3 (in rooms s, r). In room s, the interior side of the sunken west wall decorated in the Fourth Style was never redecorated, whereas redecoration of the outer wall of room s is attested by a watercolour made by the Swedish architect Isak Gustaf Clason in 1884 and further confirmed by the fragments of wallpainting found while cleaning the gutter during documentation in 2003. In room c, the walls were prepared for receiving new decorations, never applied. The atrium and the rooms surrounding it, including tablinum i, and the two flanking triclinia m and u still witness about the early layout of this house. The peristyle area is the most altered. 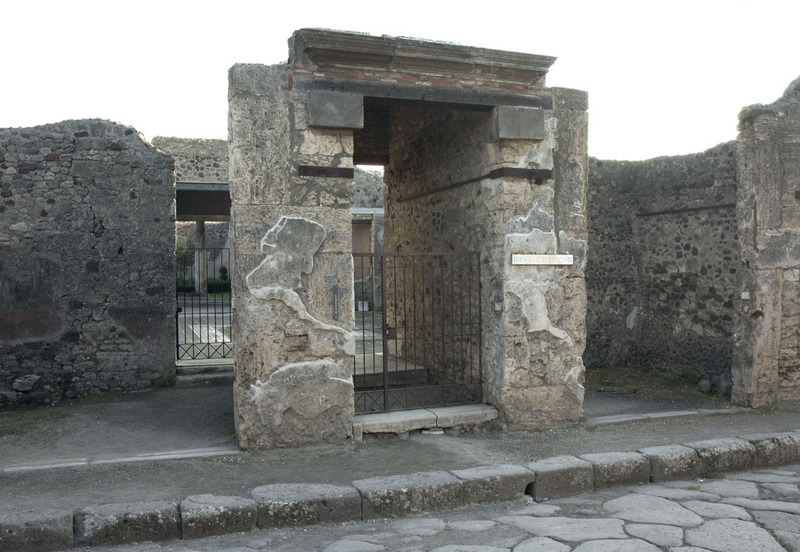 Here, the original backdoor, assembled of Sarno-ashlar was walled-up. A cellar was dug in front of it. Above, the E flank of the three-sided garden portico was closed so as to form three rooms in suite (s, r, t). 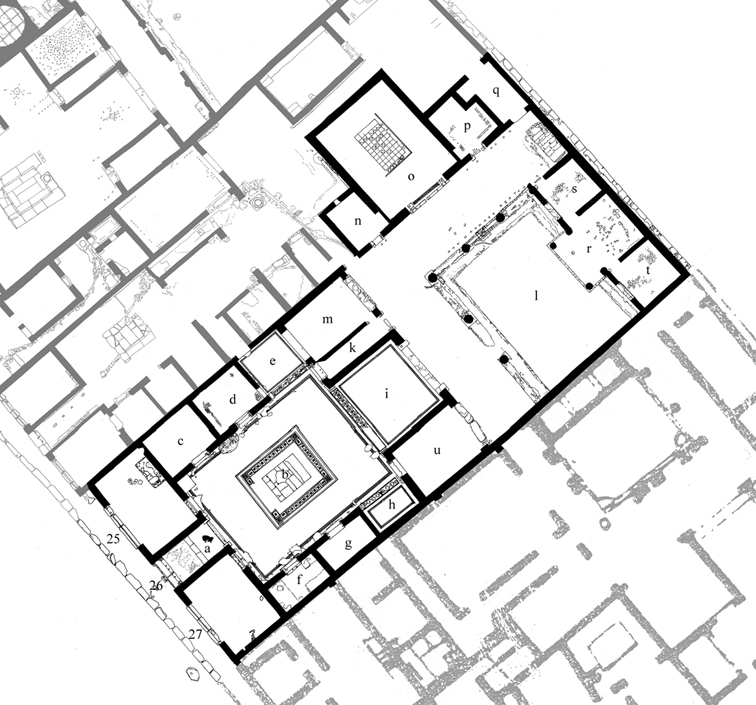 After the annexation of the E part of the neighbouring house, the orientation of the large triclinium o was changed, opening up towards the garden area of the South House. Our investigation of the two flanking rooms, cubiculum p and room n has yielded that the latter was a very late addtion, later than the introduction of the water lines and thus markedly later that the big triclinium. The full suite or rooms behind the north portico thus encroached entirely into the space originally belonging to the North House. Two corridors, one from ala e, another from the NW corner of the peristyle, and a possible third connection, from the NE corner of the peristyle (for safety reasons, room q has not been investigated), assured communication between the houses. A second storey may be assured above rooms f and n. After the unification the only staircase seems to have existed in room f within the South House, unless room q was equipped with one. Access to the second storey was, however, granted from the annexed North House, which also contributed with the kitchen and latrine facilities for both houses. Decorated walls: rooms a, b, d, e, f, h, i, l, m, o, p, r, s, t and u. Decorated floors: rooms a, b, d, e, f, h, i, l, o, p, s and t.
Suggestions in scholarship for an Augustan or even earlier dating for the merging of the two houses cannot be sustained on the basis of present evidence. The fact that the oldest wax tablet in the archive of L. Caecilius Iucundus is dated to AD 15 cannot be connected to the construction history of the house. No formal excavations have been conducted during the field work of the Swedish Pompeii project. However, in 2003 an ancient fill covering the southern part of the east peristyle gutter was removed. The clearing of the gutter resulted in the detection of four phases of decoration for the peristyle. Original excavations were conducted in 1875. Giornale degli scavi di Pompei, n.s. vol. 3, 1874-1877, 150-153, 169, 174-176, 251-256. Mau, A., "I scavi di Pompei", BdI 1875, 161-163. Mau, A., "I scavi di Pompei", BdI 1876, 12, 24, 34-35, 149-151, 161-168, 223-234, 241-249. Viola, L., â€™Gli scavi di Pompei dal 1873 al 1878â€™, in Pompei e la regione sotterrata dal Vesuvio II, Napoli 1879, 7-85.
archeologiche a Pompei ed Ercolano. Atti del convegno internazionale, Roma 28-30 novembre 2002 (Studi della Soprintendenza archeologica di Pompei, 10), eds. P.G. Guzzo & M.P. Guidobaldi, Napoli 2005, 150-155. Karivieri, A. & R. Forsell, â€™The House of Caecilius Iucundus, V 1,22-27: a preliminary reportâ€™, in OpRom 31-32, 2006-2007, 119-138. Karivieri, A. & R. Forsell, â€™New results from the campaigns of 2003-2006 in the Casa di Caecilius Iucundus (V 1,22-27)â€™, in Nuove ricerche archeologiche nellâ€™area vesuviana (scavi 2003-2006). Atti del convegno Roma 1-3 febbraio 2007, Roma, eds. P.G. Guzzo ï¿½ M.P. Guidobaldi, Roma 2008, 103-108. Eschebach, L. & J. MÃ¼ller-Trollius, GebÃ¤udeverzeichnis und Stadtplan der antiken Stadt Pompeji, KÃ¶ln, Weimar & Wien 1993, 127-128. Hackworth Petersen, L., The freedman in Roman art and art history, Cambridge University Press 2006, especially chapter 5, 163-183, 264-268. Dentamaro, F., â€™Pompei, Casa di Cecilio Giocondo: unâ€™ ipotesi di ricostruzione delle fasi edilizie mediante analisi stratigrafica delle strutture murarieâ€™, RStPomp 12-13, 2001-2002, 131-141. Presuhn, E., Pompeji. Die neuesten Ausgrabungen von 1874 bis 1878. FÃ¼r Kunst-und Alterthumsfreunde illustriert herausgegeben, Leipzig 1878. Sogliano, A., Le pitture murali campane scoverte negli anni 1867-1879, in Pompei e la regione sotterrata dal Vesuvio II, Napoli 1879, 133, 138, 158-159, 176-177, 192, 207-208, 214, 233-234, 236, 251, 291, 413, 448-449, 477, 514-515, 531, 561, 579, 582-583, 589, 594, 607, 640, 651-652, 659, 669-670, 674-677, 693, 700, 708, 759, 809, 815-816. Mau, A., Geschichte der decorativen Wandmalerei in Pompeji, Berlin 1882, 65, 302-304, 309, 311-312, 322-323, 414-415, pls. XIII, XVIII. Empire (MAAR, 8), Rome 1930. Mosaiken, Berlin 1938, 76, 96, 128, 133-134, 136, 140-145. Schefold, K., Die WÃ¤nde Pompejis. Topographisches Verzeichnis der Bildmotive, Berlin 1957, 66-68. Bastet, F.L. & M. de Vos, Proposta per una classificazione del terzo stile pompeiano (Archeologische Studiï¿½n van het Nederlands Instituut te Rome, 4), sâ€™-Gravenhage 1979. Ehrhardt, W., Stilgeschichtliche Untersuchungen an rÃ¶mischen Wandmalereien von der spÃ¤ten Republik bis zur Zeit Neros, Mainz 1987, 101-104, 138-139.
provincias (Cahiers dâ€™archÃ©ologie romande, 43), Avenches 1987, 31, 34. Bragantini, I., de Vos, M., Parise Badoni, F. & V. Sampaolo, Pitture e pavimenti di Pompei. Repertorio delle fotografie del Gabinetto Fotografico Nazionale, ICCC, Regioni V-VI, Roma 1983, 15-29.
de Vos, A., â€™V 1, 26. 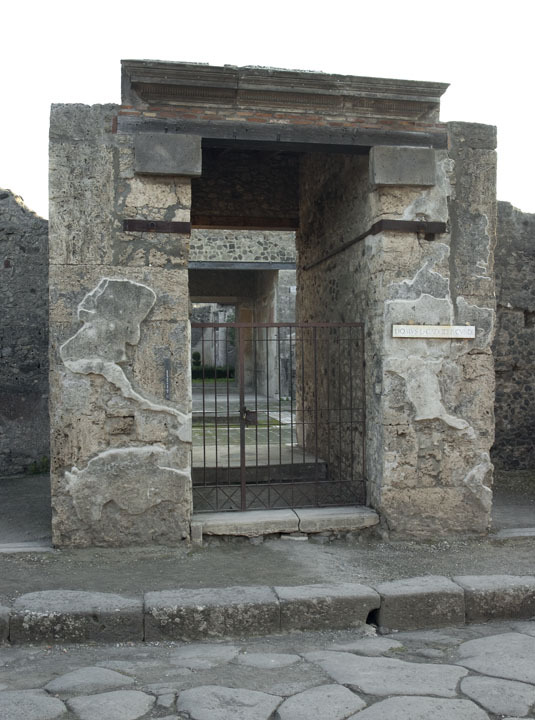 Casa di Caecilius Iucundus e casa annessa V 1, 23â€™, in Pompei.Pitture e mosaici III. Regiones II-III-V, ed. G. Pugliese Carratelli, Roma 1991, 574-620. Strocka, V.M., â€™Pompeiani, stiliâ€™, EAA, suppl. 2, IV, Roma 1996, 414-425. Richardson, jr., L., A Catalog of Identifiable Figure Painters of Ancient Pompeii, Herculaneum, and Stabiae, Baltimore & London 2000, 5, 7, 55-56, 98, 101, 130, 142, 155, 157. Karivieri, A., â€™The atrium mosaic in the Casa di Caecilius Iucundus and the aesthetics of a Pompeian houseâ€™, in Marmoribus Vestita. Miscellanea in Onore di F. Guidobaldi, (eds.) O. Brandt & P. Pergola, Cittï¿½ del Vaticano 2011, 763-773. CIL IV 3433, 4075-4092, 5508.21, 5788; CIL X 860. Boyce, G.K., Corpus of the lararia of Pompeii (MAAR, 14), Rome 1937. Warscer, T., Marmi di Pompei, vol. 4, Roma 1948. Andreau, J., Les affaires de monsiur Jucundus (Coll.de lâ€™Ecole francaise de Rome, 19), Rome 1974. Dwyer, E.J., "The Fowler and the Asp": Literary versus Generic Illustration in Roman Artâ€™, AJA 82, 1978, 400-404. Dwyer, E.J., â€™The Pompeian Oscilla Collectionsâ€™, RM 88, 1981, 264-265. Pailler, J.-M., â€™Les oscilla retrouvÃ©sâ€™, MEFRA 94, 1982, 743-822. Jansen, G., â€™Water pipe systems in the houses of Pompeiiâ€™, in Water use and hydraulics in the Roman city (AIA Colloquia and Conference Papers, 3), ed. A. Koloski-Ostrow, Boston 2001, 34-35. Soprintendenza archeologica di Pompei, 9), eds. S.T.A.M. Mols & E.M. Moormann, Napoli 2005, 277-290.